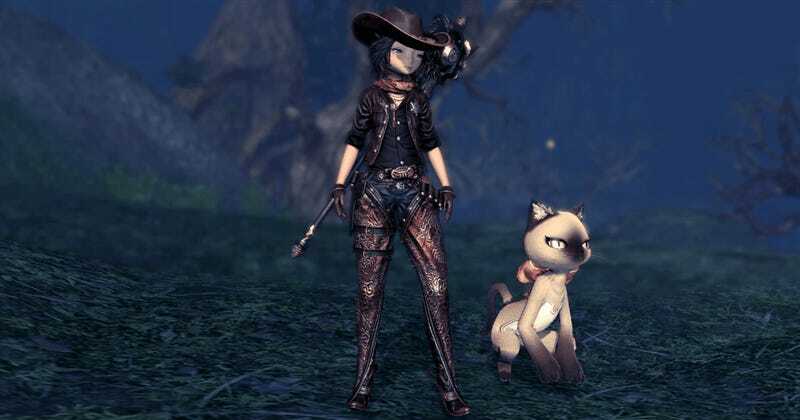 The Summoner class in Blade & Soul, NCsoft’s latest massively multiplayer Korean import, get to choose a feline companion to fight by their side for the rest of their days. There are other classes to play in the current closed beta, but they are not important. It bears noting that the cartoon of me doing cat moves with Optimus Prime hands while wearing robotic cat ears was created by our wonderful art department ages before I knew about Blade & Soul, which leads me to believe NCsoft’s Korean development team made this character class just for me. The choice was largely due to the familiar that Summoners get to choose early on in their careers. That and the hair. A martial arts fantasy MMORPG, Blade & Soul has been a staple of the Korean MMO scene since 2012. It’s got amazing movement, a complex combo-based fighting system and a cinematic flair that’s downright charming. Character creation is a blast, and I especially appreciate the clothing system, where what you wear is more choice than necessity. From my brief time in the current closed beta test this weekend I’ve also noticed that it has a lot of the downsides of Korean-developed MMOs as well—complex menus, lots of free-to-play random nonsense, and a complex upgrade system that has my characters’ bags filled with things I’ve no idea what to do with. Perhaps all will become clear the closer the game comes to its early 2016 North American release. Until then, I’ve got a kitty. To contact the author of this post bribe him with a cat, write to fahey@kotaku.com or find him on Twitter @bunnyspatial.